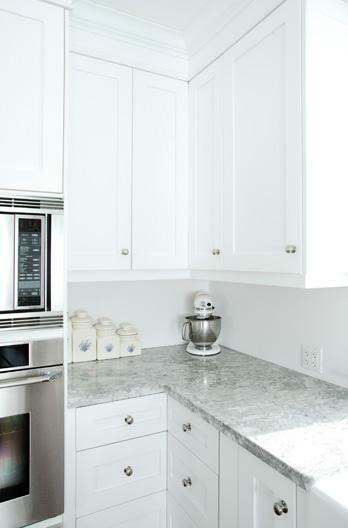 Extra storage cabinets on the island provide support for the snack counter and a niche to tuck the stools away when not in use. 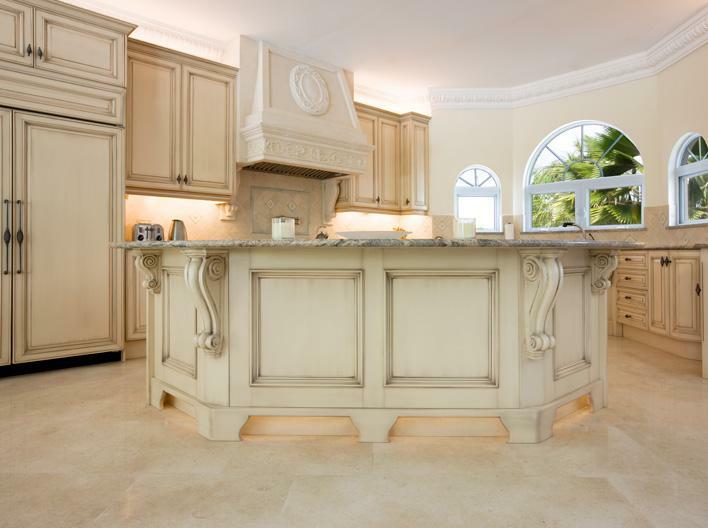 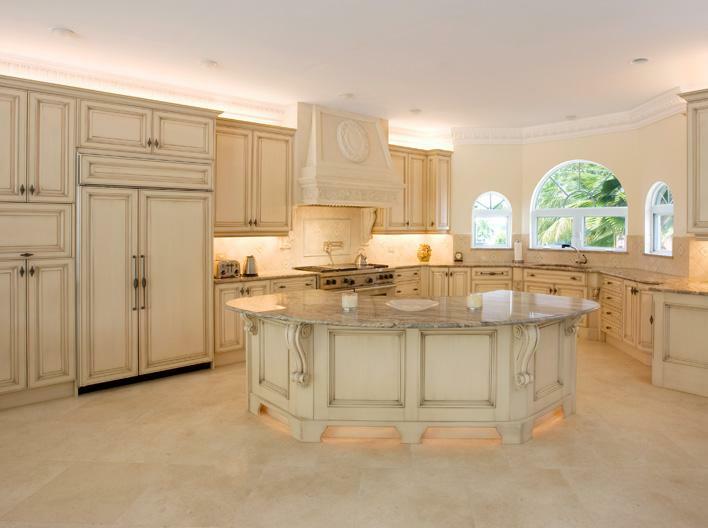 A curved double door cabinet extends the counter top to the right of the cook top while allowing easy traffic flow around the island. 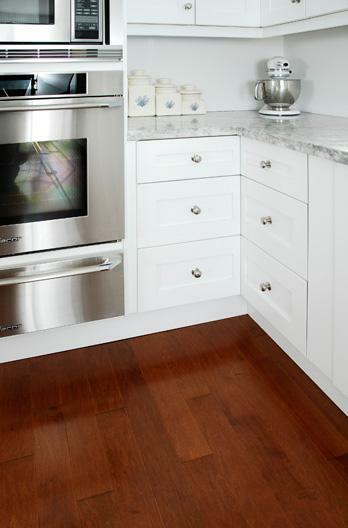 Square walnut pegs were used through the mortise and tenon joints on the doors and drawer fronts. 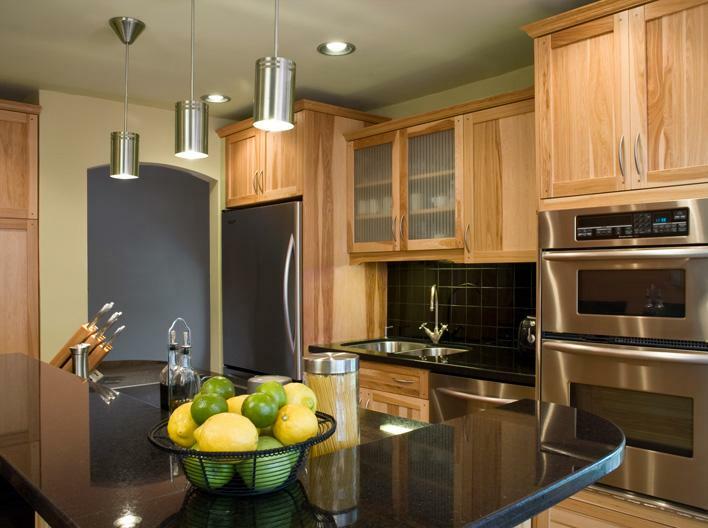 Brushed stainless steel handles compliment the appliances and provide a stark contrast to the black counters and tile back splash. 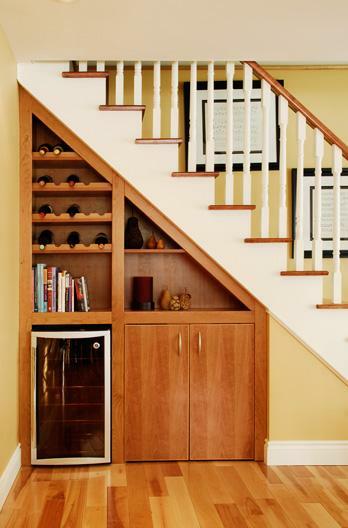 Adding a custom bar to the underside of a staircase utilizes space that would normally be wasted. 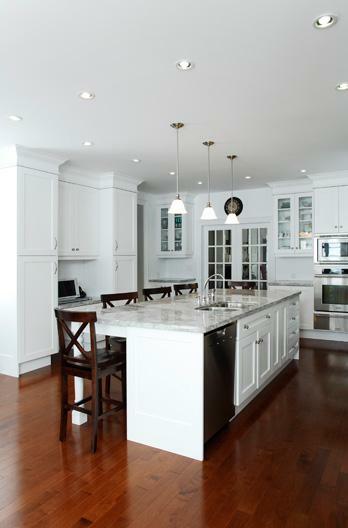 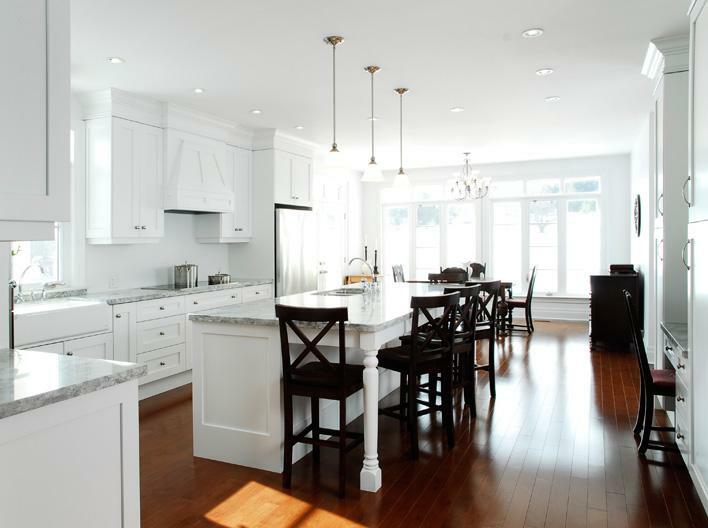 The oversized upper cabinets help to bring the overall look of the kitchen back into scale while the lower cabinets were customized to follow the detailed angles of the walls. 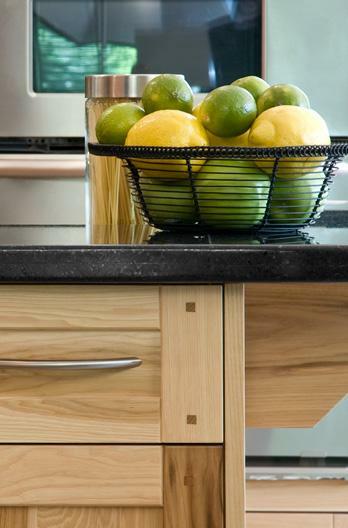 Hand forged black iron knobs add the final touch to the drawers and doors. 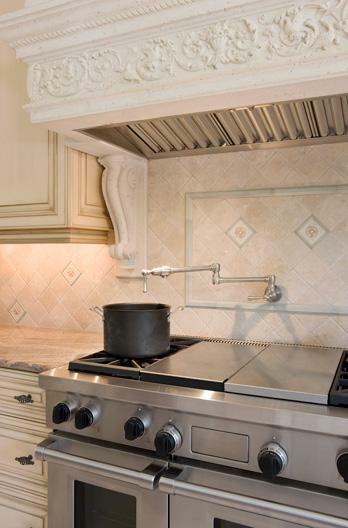 A hinged pot filler tap was installed in the wall behind the stove eliminating the need for hauling heavy water filled pots from the sink area. 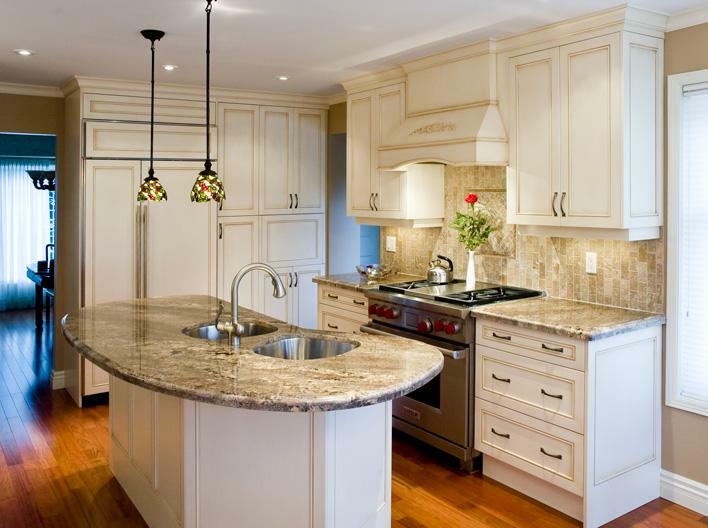 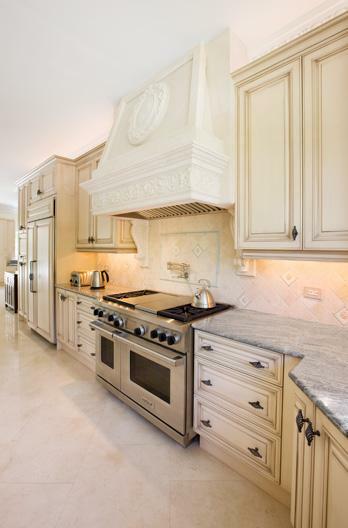 A mold was made of the maple corbels on the island fronts so that a replica could be made in light cast stone tying the hood canopy in with the surrounding cabinets. 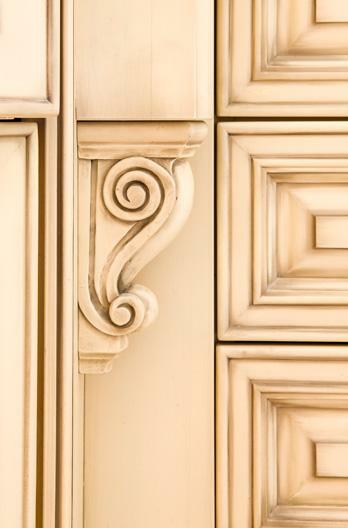 Hand carved details on the corbels jumps to life when the glazing finds its way into the deeper recesses. 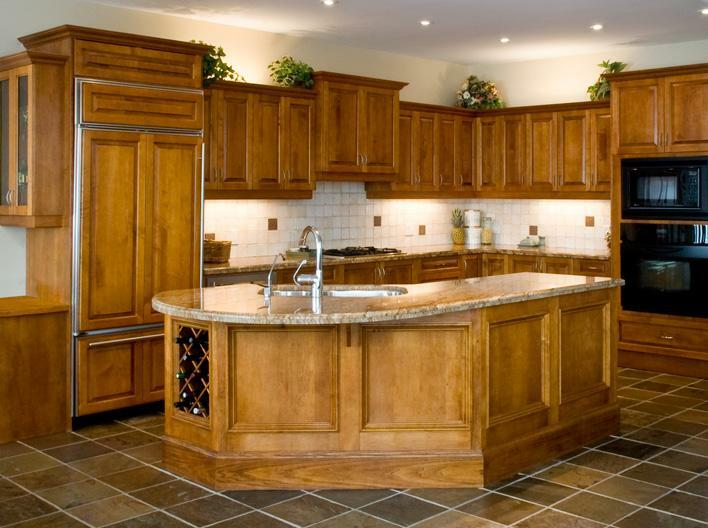 The same effect is achieved on the ornate mitred doors and drawer fronts. 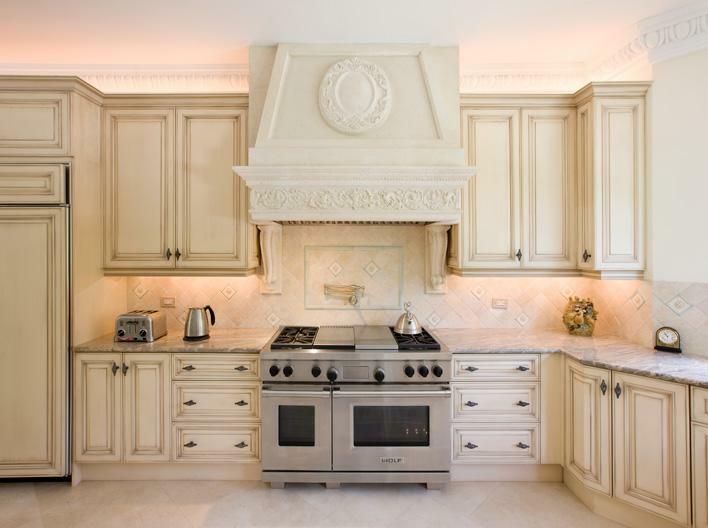 The result is a look of antique furniture as opposed to kitchen cabinets. 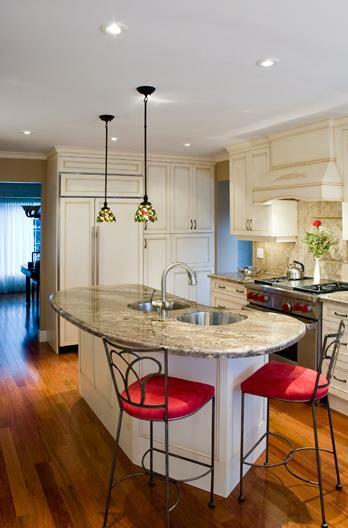 A sculpted over hang counter provides a quaint seating area with wrought iron stools. 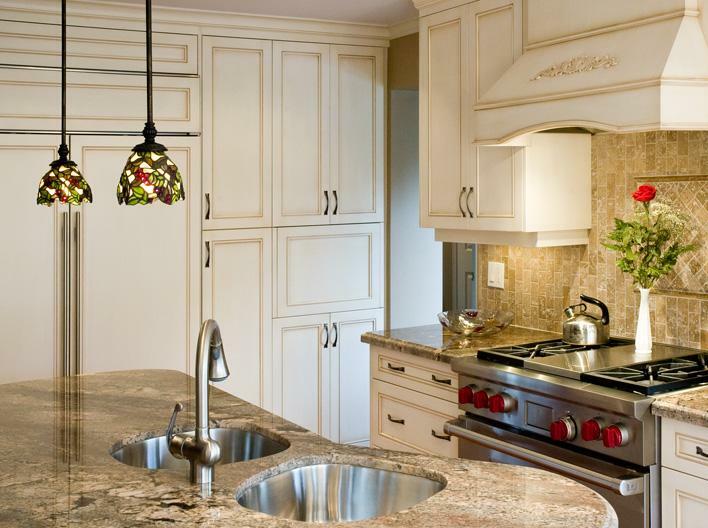 Red seat cushions accent the hanging lights and hand made stained glass panels. 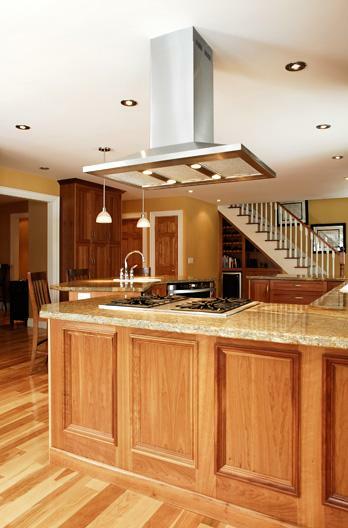 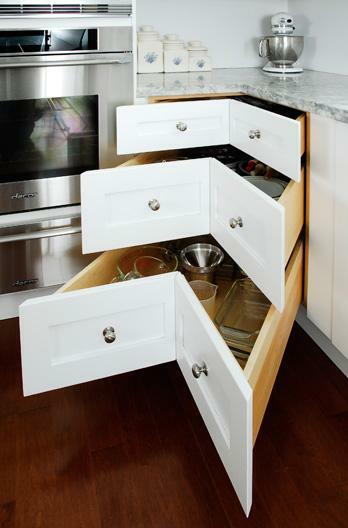 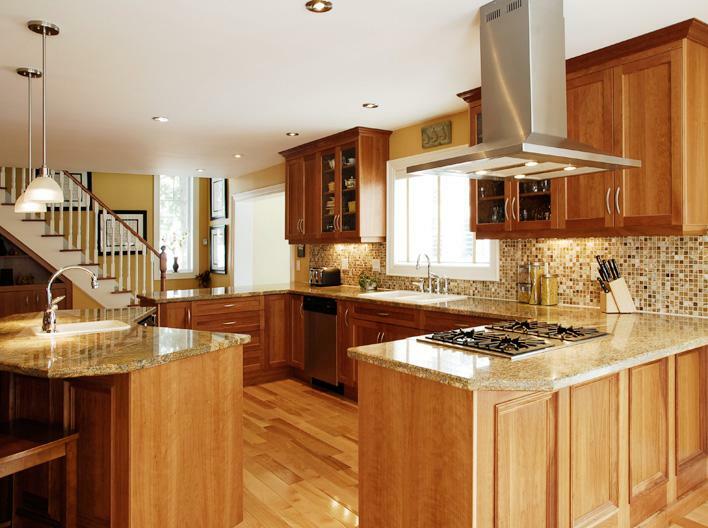 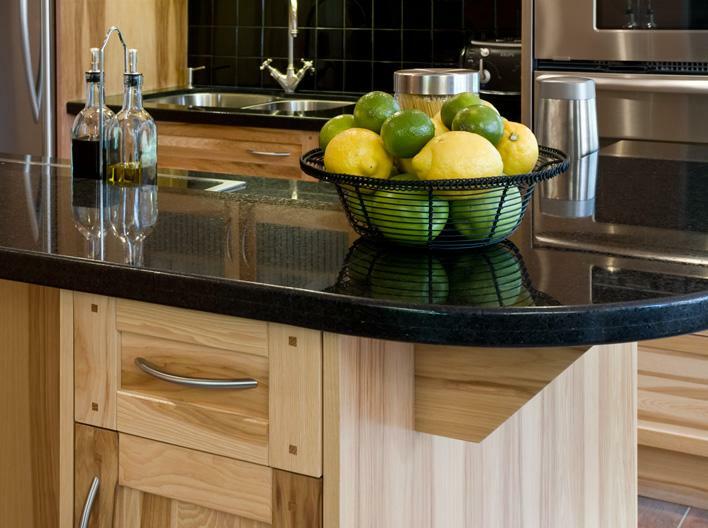 Two separate under mount sinks were used to allow a canted angle to follow the cabinet shape. 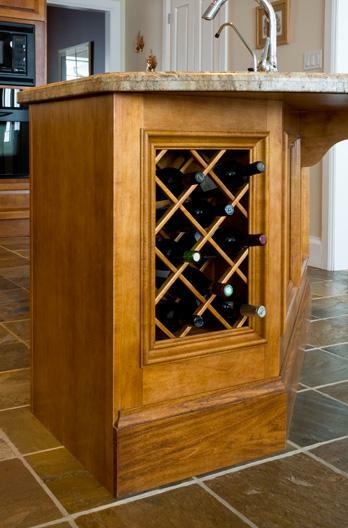 An additional pantry cabinet was added on the opposite side of the island and the wine rack is within easy reach of the table. 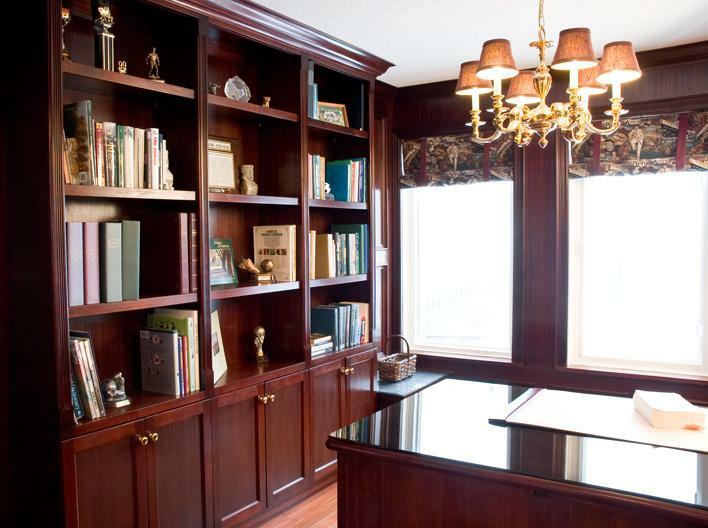 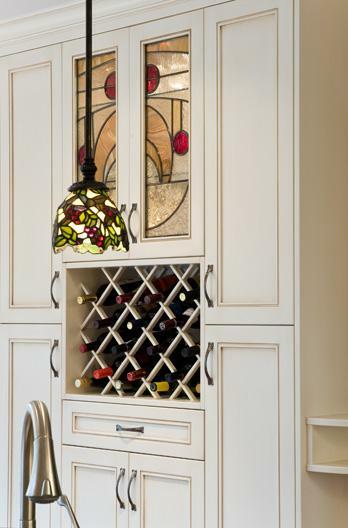 Stemware is stored behind the stained glass above and a stereo system is hidden in the cabinet below. 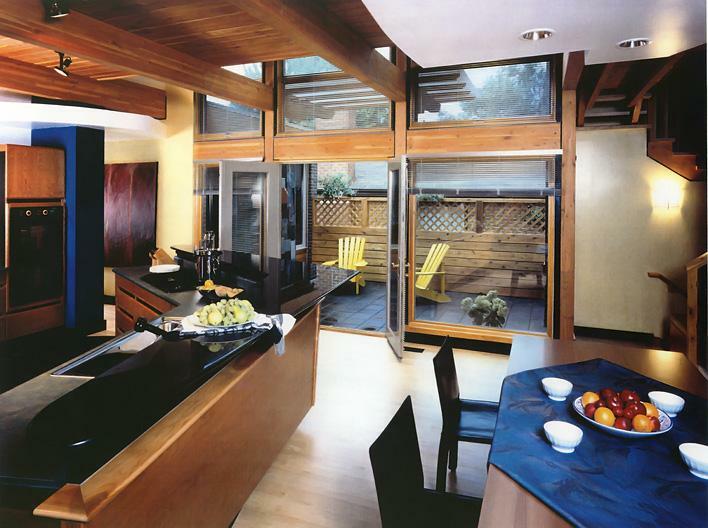 The kitchen design spills over into the dinning area with a matching cherry server complete with wine rack and concealed bar. 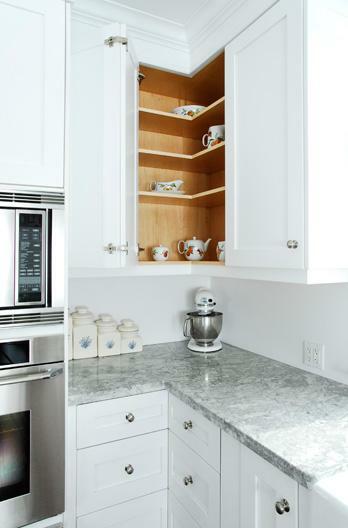 The cabinets were designed without pulls or handles to maintain the clean lines. 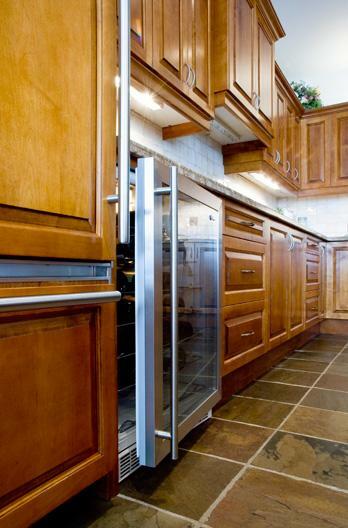 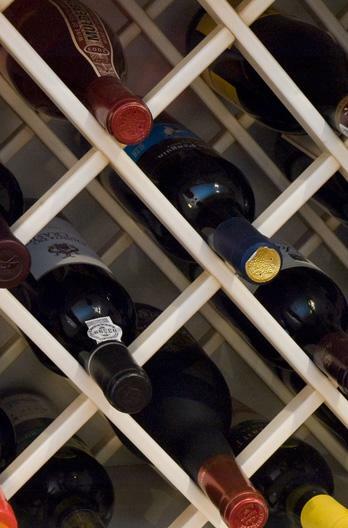 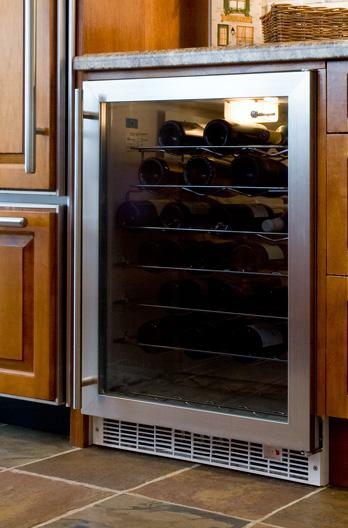 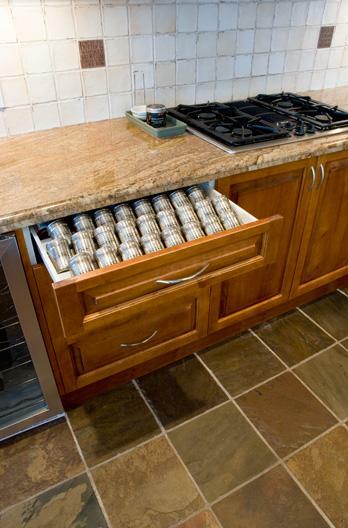 A pull out spice rack is conveniently situated beside the cook top while the under counter wine cooler frees up space in the refrigerator. 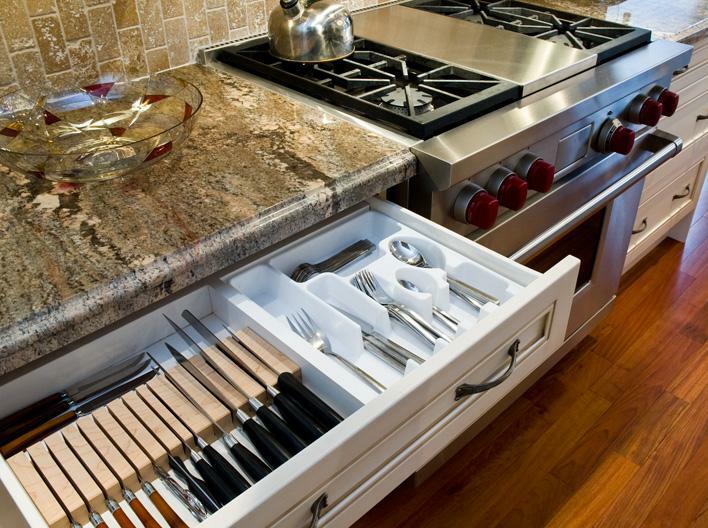 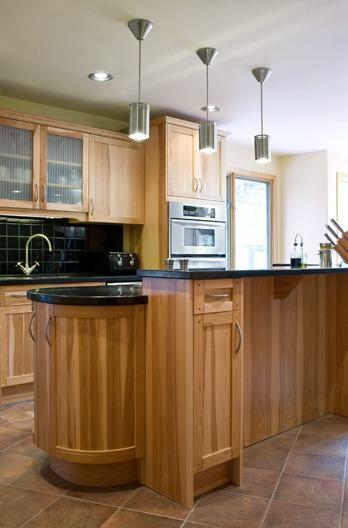 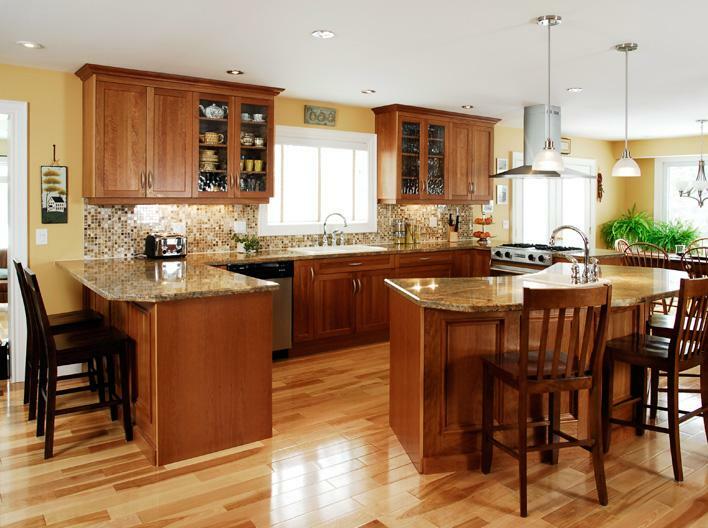 The island design incorporates the sink and dishwasher allowing for easy clean up as well as additional seating. 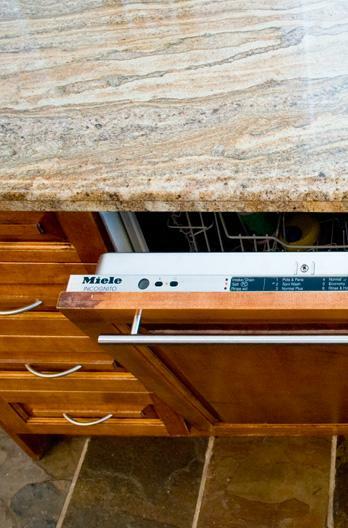 The dishwasher is integrated behind a matching door panel. 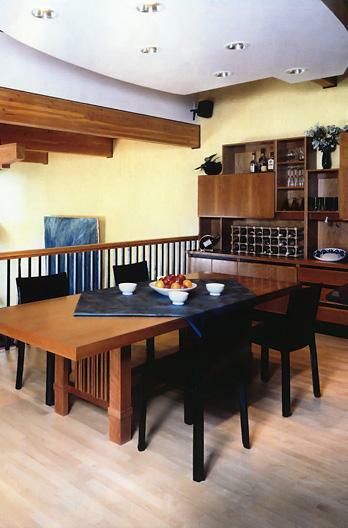 The ¾" coffer panels create a three dimensional feel to an otherwise flat wall. 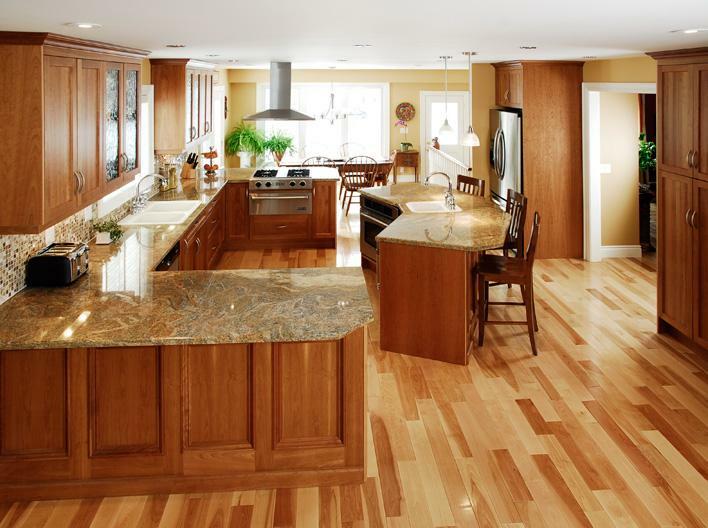 The depth is further enhanced by applying a mahogany NGR base, hand rubbing a rosewood stain and then spraying a gloss lacquer overtop. 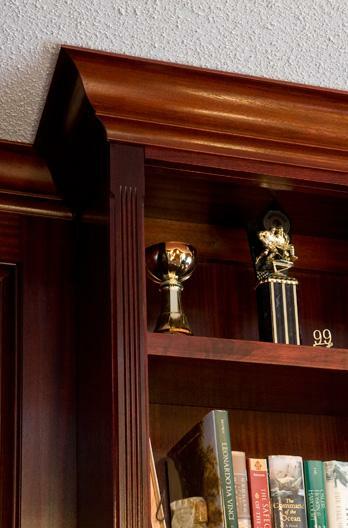 Crown mold caps the top of the bookcases and continues around the perimeter of the room. 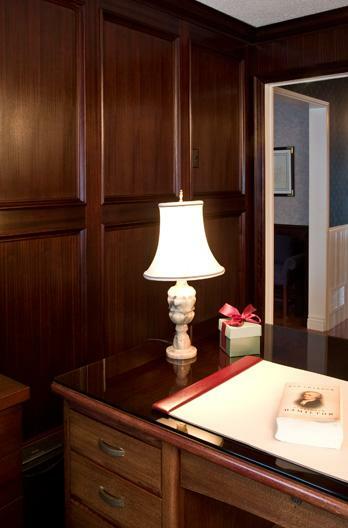 Hand cut fluting on the styles blends beautifully with the door and window casings, which were stained and lacquered to match.